Wood grain is the longitudinal arrangement of wood fibers  or the pattern resulting from this. 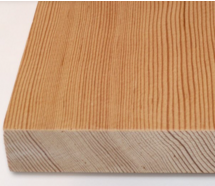 R. Bruce Hoadley wrote that grain is a “…confusingly versatile term…” including the direction of the wood cells (straight grain, spiral grain), surface appearance or figure, growth-ring placement (vertical grain), plane of the cut (end grain, quarter sawn, flat sawn, etc. ), rate of growth (narrow grain), relative cell size (open grain), and other meanings. This is a way of describing the number of rings per inch for strength grading. In the softwoods, which are commonly used for structural purposes, the rate at which trees grow effects the grading of the wood. A measure of this is provided by the relative width and number of rings per inch. Pieces of lumber with narrow growth rings generally have higher strength properties than those having wider rings, given the same percentage of summerwood. Conversely, pieces which have a higher percentage of each annual ring made up of the dense darker summerwood will have higher strength than pieces with a lower percentage of summerwood. The closer together the annual rings are and the higher the percentage of summerwood, the greater the density of the wood. Density is the single biggest factor influencing the strength of a piece of lumber. Even within a species, the denser a board is the stronger it will be, all other things being equal. Therefore, when grading structural lumber, like dimension, the rate of growth (number of rings per inch) and the density (proportion of summerwood) are considered and made a part of the grade specification. In Southern Pine lumber density and rate of growth are defined in paragraph 103.1 of the SPIB grading rules: Dense lumber shall average on one end or the other of each piece not less than 6 annual rings per inch and 1/3 or more summerwood (the darker, harder portion of the annual ring) measured on a representative radial line as specified. The contrast in color between springwood and summerwood shall be distinct. Pieces that average not less than 4 annual rings per inch shall be accepted as dense if they average ½ or more summerwood. So dimension graded and stamped as DENSE must meet the above criteria. Pieces of exceptionally light weight shall not be included in No. 2 Non-Dense and higher grades of stress rated lumber. Exceptionally light weight is defined as those pieces which contain less than 15% summerwood.